When I found out about my pregnancy, I just completed a two weeks intensive swimming program. Swimming classes every single day. I was already 4-weeks pregnant by then. "Rehat dulu dari turun naik kolam..."
So they said. But I didn't stop going to the pool completely... Hahah. Degil. It was only because of this one moment that I decided to slow down a bit; I suddenly realized I could no longer take in rice. Just so sudden like that. I had the usual portion in my plate, but only satu suap, and then cannot go on already! I felt nauseous trying to eat more. No appetite to eat rice at all. I started living on biscuits, bread, fruits, and soup. Lack of eating resulted in lack of energy... I became sluggish. I still went to the pool for personal classes, but I rescheduled them. Instead of doing back to back, I limited myself to only one class per day. Alhamdulillah for understanding students. Rescheduling classes weren't a big issue. I had two weeks off to rest before starting on the next class. I finally went back into the pool when I was 8-weeks pregnant. Honestly, at this stage I was still feeling weak, although I didn't experience any morning sickness. No vomiting, none. I guess my morning sickness was just the loss of appetite (to eat rice) which resulted in my body being so weak. Many people I knew experienced worst morning sickness; vomiting every morning, couldn't smell rice, couldn't cook. Still feeling weak and unproductive, I had to force myself to get up and get in the pool. Just because of this one class. It was a contract with a university and I had to keep up with all the arrangements made; class schedule, syllabus, transportation, pool booking, etc.. I accepted the contract way before I found out I am pregnant. I informed my students earlier that I'm pregnant. Not for the purpose of sharing joy but more to seeking empathy. Please be nice to me because I'm pregnant. HA-HA. Usually, any first lesson wasn't that tiring because it doesn't involve much movement. So I'm quite confident and told mum, it's okay I can handle them. "Ala setakat floating-floating, bubbling..." Yes, mum accompanied me to class. She even drove me all the way from Bangi to Shah Alam. First pregnancy, first trimester... Risau. Felt a bit embarrassed with students; apa ni bawa mak pergi kerja... But I don't care. I am, after all, the lecturer. Heh. By the end of the class I felt so weak! Lembik sangat! My heart was still beating so fast as if I just ran miles and miles. And it didn't recover even after changing clothes and resting for few minutes. Usually after a good workout, heart racing, I only have to blow bubbles for a while and then my heart rate would return to normal. Seriously, that really surprised me. Am I really not that fit. Seriously?! Morning session only 8 students, kut... Ajar terapung je pun... Tapi penat macam apa. I had no appetite to eat. No proper lunch. Nugget seketul dua dan air banyak-banyak. 4 hours break before the evening session. 20 students. Seriously, by the end of the second session I feel like dying already. Legs wobbly like jelly. Shivering some more. Gila penat. Really had to drag my feet up the stairs to meet mum at the pool's surau. She didn't went in for the second session. After performing Asar prayers, we went down to eat. Makan dulu sebelum hadap traffic jam. Really have to thank my mum for accompanying me. Not sure how I am driving back to Bangi in this state... Other than feeling exhausted and legs wobbly, my stomach felt uneasy too. Not so sure why. Deep inside I feel very scared and worried of my baby. But I tried to assure myself; no bleeding so it must be okay. Mum guessed I must be hungry so she ordered fried rice for me though I already said I don't feel like eating. Weeks of not eating rice made me doubt myself. I haven't eaten rice for almost one month, already. Surprisingly, I managed to finish ONE WHOLE PLATE! Before this the most I could eat was only two spoons! And I actually feel great afterwards. I feel oh so good! My stomach, I meant. My stomach felt oh so comfy, oh so content... I believe I regained my appetite. I think only God knows how worried I am about my baby. As much as I felt relieved I survived 4 hours of group class, deep inside I am really worried. I kept on thinking are you still there, baby? Are you still in there? 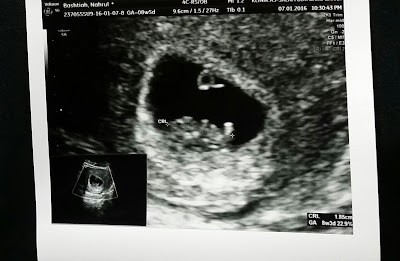 2 days after the class, I had my first baby scan (8 weeks 5 days). Another reason why I was so worried before; I wasn't so sure do I really have 'it' inside me. Upon seeing the image, just a small lump, 1.85cm, got me into tears. Tears of relief. Seeing the baby doing fine in my womb, hearing the heartbeat, the doctor assuring me the baby is okay. ESPECIALLY after taking it to the pool with me, teaching swimming like usual, everything like normal, and you are still there with me. Thankful. Sangat. Sangat, sangat, sangat bersyukur you are okay. I had tears in my eyes at the first glimpse of it. YOU ARE REALLY THERE! Aih.. Remembering that moment now (7 months) still got me touched. Life as a swimming instructor... Kejap-kejap masuk kolam. My next class, was 2 days after. The university students class. The one that made me flat out for 3 days. Amazingly, I didn't feel as tired as I did before! After class while waiting for the next session I still have the energy to take a walk around the mall, and for evening class we even have activities at the deep end! I feel so energetic that after class when I looked at myself in the mirror, I can't believe I'm actually pregnant! Because of the energy level that I felt was just the same like even before I got pregnant! I looked at my tummy... Are you still there, Baby A? Are you really with me? You're still hanging on? Because I feel so energetic! (berapa kali nak repeat..) And I feel happy. So happy. Always felt so sluggish of only resting, watching TV, the Korean series Dr. Jin, and lazing around with my cat, Chom. I must say it does affect my mood as well. Feeling unable of doing anything got me in a bad mood. Always have to depend on other people to do simple stuffs. My husband ironed his own work clothes, prepared his own breakfast. Mum did all the house chores, drove me around, prepared me food. Honestly, ever since I got back into the pool, I feel a whole lot better! Came to think of it, I didn't realize I was actually having a short workout in the water during class. Having to walk back and forth in the water, checking students' strokes as they swim somehow became like a simple workout. I also swim one or two strokes to demonstrate and when I feel better, I began to swim longer distances. I started to swim after every class, like I used to. Alhamdulillah, my first 50 meters nonstop (while pregnant) was at 11-weeks. I managed to swim 50 meter breaststroke without feeling tired! Starting from that moment, there's no turning back. I found the cure for my first trimester sluggishness. *Drink up! I always put a bottle of water near the pool where it's reachable during class. Drinking water keeps me going! I admit not drinking as much before, but I definitely feel the difference now. *Do not lift students up. I avoided from doing activities at the deep end where I have to lift them up from inside of the pool. *Stay away from students performing breaststroke kick. Or, stay in front of them. Anywhere far from their legs. *EAT. Always eat up before and especially, AFTER getting out of the pool. One of the reasons I love swimming while being pregnant; it improves my appetite. *Safe water entry and exit. As my bump gets bigger, I have to use the ladder to get in and out of the pool instead of sliding in or pushing myself up to get out of the pool. *Listen to your body. There are times I feel so tired, and during those times, I would adjust the teaching method. Like instead of making the student do kicking drills with a kickboard from end to end, I'll just ask them to perform it by hanging by the pool wall. Haha! Alhamdulillah, blessed and thankful I made it through.